This snazzy handbag is roomy enough to carry everything a busy woman needs. "Cool for Cats" is dressy enough to wear for a fun night out and casual enough for rushing off to work or play, and will become your favorite "go anywhere" bag. I started making bags because I hated not being able to find a bag with a comfortable strap and lots of exterior pockets. I also hated the dark interiors where I could never seem to find small items without a torch! This beautiful design solved all of these difficulties as well as being brightly coloured and easy to find in a crowd. The exterior side pockets are handy for that Smart Phone and sunglasses as well as a pocket pack of tissues for those on the go with their hands full. Plenty of inner pockets, one zippered for valuables and another gusseted to keep reading glasses safe so everything is in its place when needed. This beautiful bag has been hand-crafted in Australia by me from quality 100% cotton all new materials. The gorgeous all new antique-finished hardware gives it both a retro look and a snappy up to date feel. 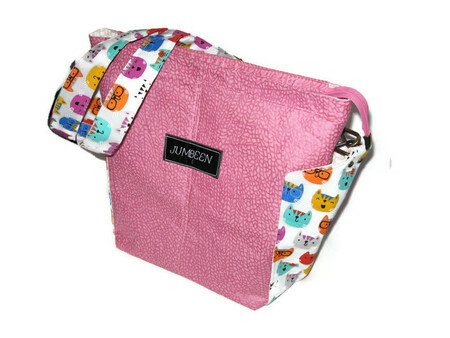 The emoticon Cats print has a soft-grey background that compliments the pink fabric. The interior is lined with linen-cotton in soft beige hearts, making it bright enough to be able to see lost items at the bottom of your bag. The Pattern is "Ellen's Esplanade" by ChrisW Handbags, Australia. The handbag measures approx. 38cm W (at the top recessed zipper) x 29cm H x 14cm D (15" Wide x 11 1/2" High x 5 1/2" Deep). It is fully machine washable on a gentle cycle (just slip it into a pillow case, before washing, to protect the hardware). Line dry then a gentle iron will restore it like new. Postage within Australia is included in the price. Please read my Store Policies before confirming your order. Goods will be shipped within one business day after payment has cleared.